A compact evergreen shrub native to Mexico, the Mexican orange shrub (Choisya ternata) is also called Mexican orange, mock orange and Mexican orange blossom. It flourishes in U.S. Department of Agriculture hardiness zones 8 through 10. It grows 8 feet tall and equally as wide, bearing deliciously fragrant white flowers in late spring and again in early autumn. This is generally a disease-free plant, but poor maintenance can lead to fungal diseases. Other problems may be caused by snails, slugs, aphids or poor soils. When the Mexican orange shrub is planted too deeply or in heavy soil that is slow to drain, various fungal diseases can occur. Cool, damp weather or planting it in too much shade can also encourage rot on shrubs. Root rot causes the disintegration and death of underground roots, while crown rot destroys plant tissues in the area where the root and trunk system fuse. Eventually, the flow of water and nutrients to the stems and leaves is disrupted, and the entire plant suffers. Streaks of gray spores typically found on a plant's dead, rotting tissues are referred to as gray mold. Moist growing conditions and stagnant air can allow this fungus to grow on healthy leaves and stems of Mexican orange shrub. 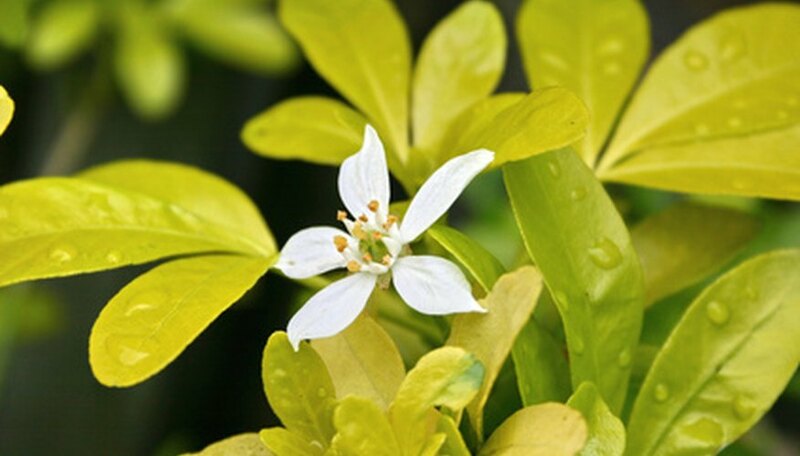 Gray mold is one reason for stem die-back on many species of Choisya, including Mexican orange shrub, according to Garden.ie, an online Irish gardening magazine. Scientists discovered in 2001 that the viral disease Arabis mosaic can afflict Mexican orange shrub, according to a scientific paper published in "New Disease Reports" in the United Kingdom. The Central Science Laboratory in York confirmed that the Arabis mosaic virus was present in the roots and leaves at different times of the growing season. Symptoms include flecks on leaves or leaf deformation, but this virus can also exist in the plant without any outward symptoms. This was the first documented report of any virus afflicting a species of Choisya.